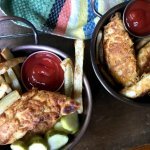 Tender, juicy, and flavorful pickle brined chicken tenders lightly breaded and sautéed in a skillet. If using chicken tenders, trim the white tendon out of the top of the chicken tender. Lay raw tenders in a Tupperware, then cover them with pickle juice and water. Cover tightly and refrigerate for 8-10 hours. The longer the brine time, the more "pickle" taste will come through. In a bowl, add flour and spices, and stir together well. Set aside. Remove the raw chicken from brine, dab each piece of chicken dry with a paper towel, and then place into a plastic bag. Add 1/2 tsp kosher salt and 1 tsp vegetable oil, then massage the bag to make sure the chicken is completely coated. Add seasoned flour to the baggie and shake the chicken well until the pieces are completely coated. Warm up a large skillet over medium heat. Add 2.5 teaspoons of vegetable oil. When the oil is hot, add half the chicken, and cook for about 4 minutes on each side, or until golden brown (And until internal temp reaches 160 degrees). Remove and set aside. Put remaining chicken in skillet and simply repeat above instructions again. When the chicken is finished cooking remove from pan, set aside, and let it rest for 5-10 minutes as needed.